Two words: Smoked Paprika. Where did I first see this recently? I honestly can’t remember because I would certainly post the link here to give credit where it’s due. 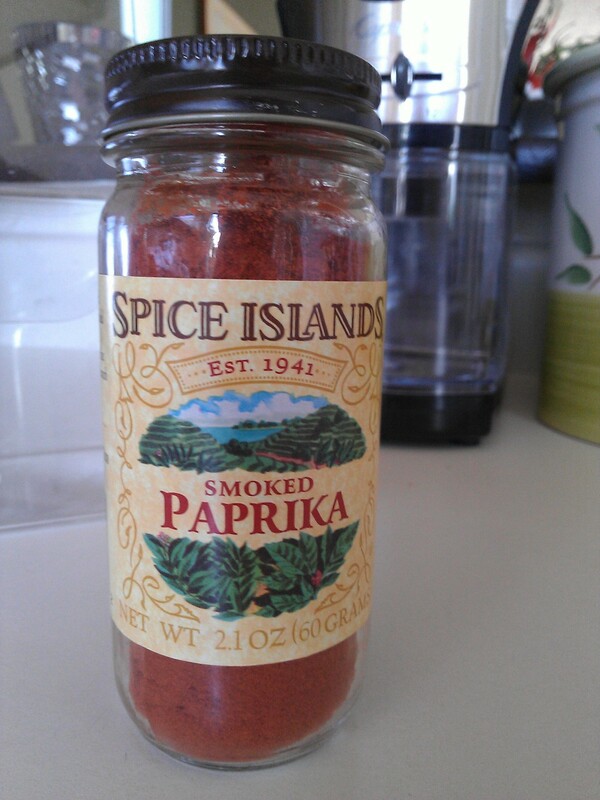 I’d never, ever heard of smoked paprika until just yesterday and for some reason got intrigued. I had to find out more about this spice! I enjoy cooking with the more typical sweet paprika for sure…quite a few of the various South American soup recipes I’ve posted in here call for paprika. I smile and remember the thrill of two trips to Budapest, Hungary in my lifetime (SUCH a beautiful city – very highly recommended) and picking up some tins of paprika in the busy markets on the Pest side of the (Danube) River. Great gifts and souvenirs; after the paprika is used up the tins are so pretty for decoration or re-using. It was meant to be. I had to make a quick trip to the grocery store today and ta daaaa…many of the spices at the Albertson’s down the street are half off for the next few days! I don’t mind splurging on food at all – I budget quite a bit toward eating out and grocery shopping actually – but stocking up on spices can add up! I will likely now go do the “smell test” on every other spice I haven’t replaced recently to see if they’re still fresh. And I’m a bit of a goofball because I alphabetize my spices in my pantry. But how else can you quickly find what you need? Smoked paprika, welcome to my spice shelves! I found this recipe in an online search and just whipped it up in my mini Cuisinart (the one small appliance that doesn’t have a broken latch or leaks). This makes about 1 1/2 Cups so the mini food processor is a perfect size. The vinaigrette is a beautiful, deep rich orange color…so pretty to look at and the flavors are incredible! Blend all ingredients except the olive oil in a blender or food processor until thoroughly mixed. Drizzle the olive oil into the mixture while blending on low. Cover and chill at least one hour before serving. Fivenineteen notes: taste the vinaigrette and add a tiny pinch of white sugar if it’s too tart for your taste. If you’re using a food processor, the little hole at the top is perfect to slowly infuse the olive oil with the rest of the ingredients. I was a little nervous about using the honey in my pantry because it’s raw. It doesn’t flow out of the jar like typical honey does – it’s so thick you need to scoop it out with a spoon…you can turn the jar upside down and it won’t come out. But it turned out great! This is also a wonderful choice for a marinade…I can’t wait to try this tonight!